CCI Blazer Brass 9mm Luger 115 grain ammo is optimal ammunition for your next time at the shooting range. With 350 rounds of this full metal jacket ammunition, you will have reliability for any target shooting or plinking. Built to SAAMI standards, and backed by ISO certified quality systems, Blazer Brass brings you the best bang for your buck in bulk 9mm ammunition. Does the ammunition can these rounds come in have a significant seal/gasket for long term storage, or is it simply a novelty? BEST ANSWER: From my experience it has a small rubber strip in the lid to help seal it. Is it the best ammo can? No but it’s decent. Functions flawlessly. Much cleaner than white box. I will start to purchase from you again when you stop this " mail in rebate " for ammo nonsense ............ who has the time to bother with rebates ! I enjoyed using this ammo for training. All rounds fired with no problems. Outstanding can’t say enough about PSA quality! 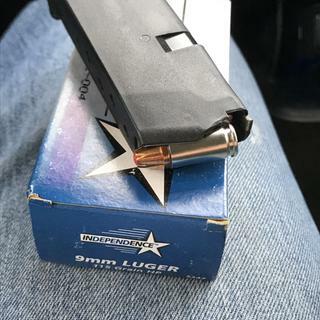 Blazer brass 9mm 115gr just doesn't eject properly in Glocks, it's really not a Blazer issue as it is a 115gr issue. A bunch of ammo, a box to store it, and a low price? Very good buy! No problems. The Blazer ammo is reliable and trustworthy. I've used plenty over the past year and it has never mis-fired at the range. Palmetto ships on time, with solid packaging and they fulfill the order as stated on their site. I'm happy and would recommend this company! I love Blazer Brass - my Glock 19 Gen4 and my M&P 2.0 full size eat it up. PSA with another great deal. Definitely my first place to look for quality products & great prices. Great ammo, shooting well with zero malfunctions in my Sig P320. Would buy it again..
Clean to shoot, very consistent in accuracy and no ftf or stovepipes. Great buy! Price can't be beat and free shipping made it better. Love this ammo for the range, especially in bulk. Thanks PSA! Great ammo. Palmetto does a great job. At least 87 reasons to buy this ammo. Pretty reliable range ammo, and with the free shipping deal it was a great value. For best results, fire it directly from a moving treadmill. The rumors that it cures erectile dysfunction are still unconfirmed. Used this in my Ruger PC9, P95, Kimber micro, SW shield. No issues. Palmetto is great to deal with and ships to this state! 5 Star service and 5 Star products!!! Excellent value and stores well. This is by far the best value for very good quality. Comes with the case and stores well. Sturdy plastic case with 7 boxes of ammo. Prefer 124g but this was such a deal, could not pass it up. Great deal on some good Ammo! best price for practice ammo, no issue with my CZ, free ammo can is nice touch. Good value. Great for the range. I’ve shot quite a bit of Blazer 9mm in the past. It’s a very consistent product. I’ve shot it thru Glock’s & M&Ps with no problems at all. Great stuff. Ordering/Delivery were flawless. Performance of the product was consistent with past usage. Would purchase again! Use this ammunition at the range does very well been using for years great price! Excellent product, great price, and prompt delivery made this the best deal I've had on ammo in a long time. It’s nice to get bulk ammo with an ammo box. I dump the individual boxes into the ammo box. It’s easier to load high capacity mags when you can grab a handful. Price is right and it shoots great. The ammo case works great for going to the range. Ammo always fires. Very clean ammo, zero misfires, great pricing, super deal, free shipping. Great Target Ammo, and the ammo cans were a bonus. Quality ammo at a great price. Not one issue after the first few hundred rounds! Great value. Can't go wrong. 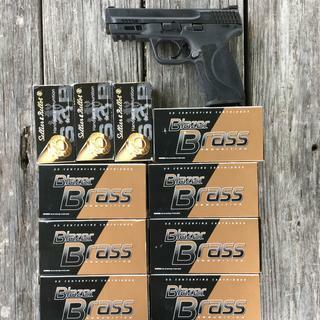 CCI Blazer Brass 9mm is one good buy. Clean burning and very accurate in my FNS9 and Ruger LC9S. I always look on Palmetto State Armory for the great deals they have CCI Blazer Brass and also aluminum. This ammo shots great at the range in the 9mm's and my Springfield RO .45. Just can't beat it for the price, just ordered another 1000 rounds. Waiting for the CCI .45 ammo sale. Great buy, delivered to the front door! Can't ask for a better deal! Great 9mm brass case ammo and very nice ammo can (IMO). Like others, I just wish I'd bought more of it while it was on sale. No jams and it is reloadable. I have fired 500 rounds of this stuff out of my Kimber micro 9mm and never had a single problem. Quality is great and price is outstanding at $60 for 750 rounds. Delivery was on time and packaged very well. For the price it’s great. My walther ppq ate it with no problems at all. As well as the beretta nano.